One question on which I have had a long-standing difference of opinion with most of my friends in the biggest publishing houses — or at least with their publicly-stated views — is whether it is sensible for them to sell direct to end consumers. At the same event, Sourcebook founder and CEO Dominique Raccah enumerated useful things her company is able to do because they have direct customer contact, including testing out ideas for covers with live potential customers. And following that, Andrew Rhomberg, a founder of the fledgling ebook bargain and conversation site, Jellybooks, took up Dominique’s side of this not-quite-engaged discussion in a post on the Digital Book World blog to make the point that the data publishers can gather through experimentation makes it worth having the direct customer relationship. I agree with Andrew that publishers should sell direct, but the experimentation and data-gathering arguments he made — which actually resonate with the Jellybooks mission to improve discovery through both a different merchandising approach and by creating Groupon-like “deals” to entice purchasers — don’t strike me as the most persuasive arguments to make the case. Our friends at Vogue Knitting Magazine use their Twitter followers to get opinions about how they should handle certain editorial choices they face for their magazine, just by asking. Madeline was not saying that Random House shouldn’t have conversations directly with the readers of the books they publish. And they are certainly familiar with the point about data made by Dominique and emphasized by Andrew. They are, after all, the publishers of “The Lean Startup” by Eric Ries, which emphasizes the use of feedback loops to shape business strategies, including for the launching of the book! And everybody who knows Random House knows they are an analytical, systematic, and data-responsive organization. That’s a powerful concern and it is built into the DNA of the biggest trade publishers. Selling direct works against the magic of trade publishing, which is the leverage provided by so many intermediaries helping reach the end consumer. I remember five years ago, when I was running most weekends with a Big Six C-level executive, telling him that I had just come around to the point of view that publishers should sell direct. He hadn’t then; he may not have yet. I once had the (on more reflection) crazy idea that if all the publishers sold all the books of all the other publishers. there would be such a vast array of deal choices in the ecosystem that it would undercut the attempts of retailers to win share by selectively cutting prices. But agency pricing changes that game because the price of an agency-model ebook is the same in all sales venues. In that case, does it reinforce the old logic of pushing sales through the intermediaries (as my running partner then and Madeline now apparently believe) or does it point to the path Raccah and Sourcebooks have taken, that Macmillan seems headed for, and which Rhomberg supports? I think the latter. Here’s why. We’re at the point now where all publishers understand that direct customer contact is essential. They may not all be fully aware that they are in a race with authors to gather the lengthiest list of useful customer contacts, but they are. The conversations between agents and publishers will very shortly start addressing how many names and permissions the author has with the number of names and permissions that apply to the author’s book the publisher can provide. 1. If you have engaged in a dialogue that has “made” the sale, you don’t want to take the chance it will get “unmade” by sending the customer to a retailer with a vast array of choices, often suggesting other publishers’ books right on the same page which houses your book. There is wisdom that says every required click costs sales. Sending the purchaser to a retailer to execute a sale you have made not only lengthens the click stream, it introduces distraction and competition. 2. When an agency publisher makes a sale through an intermediary, it pays the intermediary 30% of the customer revenue for execution. Making the sale directly, adding that 30% to the 70% which would otherwise have been the publisher’s and author’s revenue, adds nearly 43% more revenue. Nobody is expecting publisher-direct sales to become a big share quickly, but a 43% increment is large. In some genres and niches, publishers might get to 20% direct sales in the next few years. In that case, selling direct would add more than 8% to their income, and to the income of any of their authors working on a percentage of the publisher’s net ebook revenue (which is almost every one that has earned back their advance). 3. It is much easier to execute further engagement with direct customers than through intermediaries. And further engagement is soon going to be desireable and before long will become essential. For example, an author could write a new ending or epilogue to a book (think non-fiction, not just fiction; this is already a big deal at tech publisher O’Reilly) that the author and publisher would want every prior purchaser to have for free. Easily done if the customers are yours; a huge pain if they aren’t. Or a publisher next year might be happy to provide non-DRMd ebooks for customers who previously bought protected versions. Or a publisher and author might want to try an experiment of sending a sample of half the author’s next book for free to the readers of the last one. It will be far easier to get retailers to play along on things like this if they have to do it to remain “competitive” (more reminders that competition won’t just be about price!) with what the publisher provides its direct customers. No retailer jumps for joy about publishers selling direct. 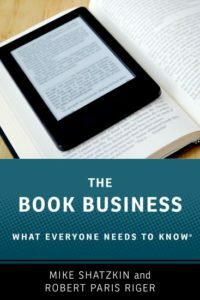 Those publishers that do now, including Sourcebooks, the enthusiast publisher F+W Media (our partners putting on Digital Book World), and others, are usually publishing titles that are outside the circle of highly price-promoted big books. They’re managing to do it even without agency pricing. (I can’t resist noting that the DoJ doesn’t seem to care that Amazon won’t let these publishers use agency pricing, even though they might work that way with other retailers and, in my opinion at least, putting them at a disadvantage against their larger competitors). But one clear lesson we should have all learned by now about digital change is that the bright lines that divided the author function from the publisher function from the retailer function are progressively being erased. It is possible for any of these players to perform any of these functions. (Indeed, a key idea behind Joe Regal’s new Zola Books business is that authors can do their own curation and become retailers, an idea everybody will have to wrap their head around just when we’re getting used to the idea that authors can become publishers!) Amazon isn’t shy about publishing; publishers need to overcome their reticence about retailing. The guess here is that the ability to sell direct effectively will be seen as a necessary survival skill for publishers by two years from now, if not sooner.